Moving house is difficult but when you are moving country, alot of items have to be left behind. My Perfume stash must have been the hardest to leave behind. I could only pick my best and favorite ones to bring with me all bubble-wrapped and shipped with me to the UK. I came up with this idea of using this gorgeous detailed tray on top of my Ikea Alex 9 Drawers to showcase the current fragrances I have here with me. 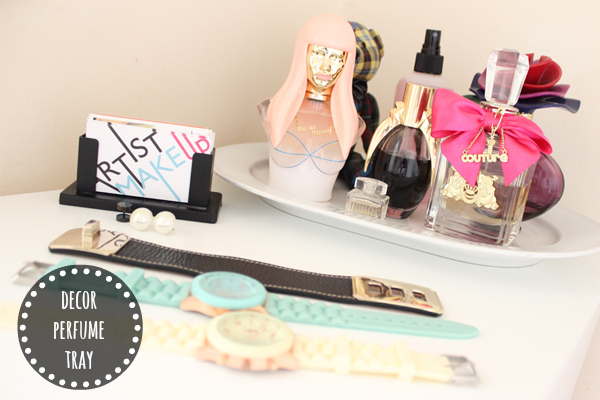 Keeping it simple adding a pop of colour by having some pastel watches to the mix. My all time favorites are on this little tray including a miniature sample size of CHLOE as my 30ml finish but has been my staple fragrance scent since 2010. Next are Pink Friday by Nicki Minaj, Juicy Couture Viva la Juicy and also two others Lady Gaga's Fame and Marc Jacobs Lola in the back which is on it's last drops sadly. I was also thinking of adding some candles and maybe a pot with some flowers to fill it up after my desk arrives that will sit just by this. How do you organise/store your perfumes? Any favorites? Wow what a great idea! i so need to organise mine properly, thanks for sharing!